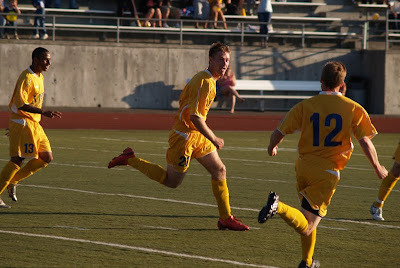 GOALSeattle.com News & Commentary: Tacoma-6 Yakima-2! Tide win first-ever division title! Tacoma-6 Yakima-2! Tide win first-ever division title! Top: Spencer Schomaker's header puts TFC up 2-1. Middle: Celebration after the goal. Bottom: Celebration after Ruben Orozco makes it 3-1 Tacoma. 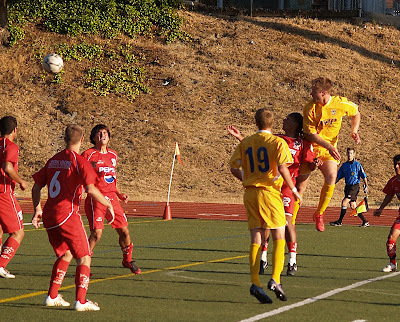 Tacoma Tide FC scored 3-1 advantages over the Yakima Reds in both halves and crushed their cross-state rivals 6-2 at Curtis High School on July 19th. In Utah the Ogden Outlaws upset the Vancouver Whitecaps Residency 1-0. TFC and Vancouver finished the season tied with identical 11-4-1 records and 34 standings points. The PDL standings tiebreaker rules list the first tie breaker as head-to-head points. Since Tacoma and Vancouver split their two matches this year (5-5 goals for and against) the next tie breaker was overall league goals for and against. The Tide win the Northwest Division crown, their first ever, by virtue of scoring 46 goals and giving up only 23 (+23) to Vancouver's 34-14 (+20). It was a nervous initial eleven minutes for the Tide. 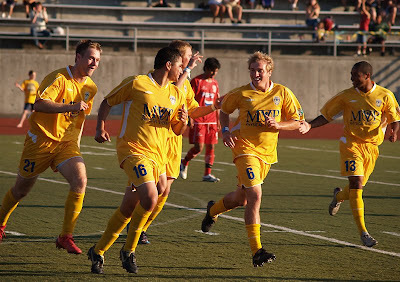 Tacoma knew a draw or a victory would put them in the 2008 PDL playoffs. The Yakima Reds knew only a win over the Tide would put them in. The Reds dominated the early part of the match and went up 1-0 on a goal by Garcia in the 11th after a hit post rebound gave him the ball for the tap-in. The Tide seemed unsettled until the 16th when Dennis Sanchez flicked a ball into the Reds' box that was knocked in by Spencer Schomaker. Only two minutes later Schomaker headed the Tide into a permanent lead when he perfectly placed a ball off of a throw in from Tucker Maxwell. The Tide were rolling from then on out and had numerous chances on goal the rest of the first half. The third goal, eventually the match winner, was scored by Ruben Orozco in the 31st. His blast into the far corner of the goal came off an assist from Schomaker. Tacoma's 3-1 halftime lead gave them a bit of a cushion to play with. The second half looked to have far fewer fireworks until the 70th minute when Rafael Cox scored on an assist from Chase Tangney. By that time the Reds were playing with 10 men after Al Valencia was ejected for being the last defender behind the ball and tripping Tacoma's Rory Agu. Technically the lead official had the rule book in his favor, though the call seemed harsh. There were still three goals left to tally and they all came in the 80th minute or later. Yakima drew to within 4-2 on Garcia's second score. Then Rory Agu (82nd, assist to Schomaker) and Schomaker (90th, assist to Brayton Knapp) completed the rout. Schomaker ended up leading the Tide with the hat trick and two assists. The nerves had turned to adrenalin, and the adrenalin had turned into the Tide's 18th straight match at home without a loss dating back to 2006. 500 fans celebrated the win with the club in the bright Tacoma evening sun. Afterwards hugs and applause greeted the guys as they left the pitch and later came out for autographs. TFC will travel to Fresno this Friday to play the Fuego for the second straight year in the first match of the playoffs. Read why that ticks this Tide fan off here.